It is no secret that side impact protection is essential for babies since many side impact crashes result in fatalities for the smallest of us. Until now there was only one company that took side impact protection seriously (you know who you are). Safety 1st is catching on to essentials in safety with their debut of the Complete Air Convertible Car Seat. Thank you Safety 1st for sharing your new technology with us and providing a car seat for review. For all the parents out there, below is our experience with this car seat (with our 18 pound baby) which will hopefully help you make an educated decision on whether this is the right car seat for your child. COMPANY: You might be surprised to learn that Safety 1st, Cosco, Eddie Bauer, Maxi Cosi, and Quinny are all related as part of the Dorel Juvenile Group. What does this tell you about this car seat? That you can expect good quality at an affordable price point. The Dorel Juvenile Group is based in Foxboro, MA (local for me!) and they have twenty five years of experience behind their back. Safety 1st was acquired in the year 2000 and has always been a leader in child safety products. SAFETY: Among the safety features of the Complete Air Car Seat is the Air Protect Side Impact Technology. The head is the most vulnerable in a side impact crash, hence these good looking side 'pillows' are designed to protect your child's head on impact. Keeping a baby rear facing as long as possible is one of the best safety measures you can take as well. A baby can stay rear facing up to 40 pounds in the Complete Air Car Seat. It also has the standard five point harness for your child's safety. When it comes to car seat safety, installation is everything! So be sure to have your car seat properly installed because that alone might save your child's life. It shouldn't budge more than one inch in any direction. EASE OF USE: I'll be honest, this is not the easiest car seat to install rear facing (at least in our car). There will be some tweaking to do depending on what model car you have. If you do decide to buy the Safety 1st Complete Air, I suggest you either try it in your car before you buy it (at Babies R Us perhaps) or at least research online what the experience of other parents has been with a specific make and model of the car you intend to put it in. We have a 2007 Honda Accord and I do not recommend it for this car in the rear facing position. It fits only if the driver's or passenger's seat is pulled all the way forward, in which case my husband can't drive because he is 6'2". Forward facing though it is great for any car and I have no issues with it. The LATCH system makes installation a lot easier in any newer model cars. There is also a QuickFit Harness System, which means you don't have to re-thread the harness to adjust height, you can just do it from the front. It also features an easily removable cover for no fuss maintenance. 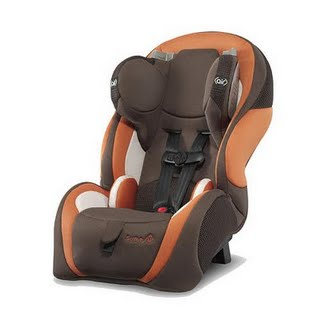 COMFORT: The Complete Air car seat is quite comfortable because of the head support it offers and the design of the seat. It is comfortable for the baby to sleep in as the head does not slouch on the shoulders. The seat is not very plush but comfortable and shaped well for the baby's comfort. I really like that the bottom strap of the five point harness is adjustable. It is great to be able to change how deep the strap is placed in the seat, this is especially important for a newborn. Of course as your child grows you'll appreciate this feature as well because you will not have to fish for the strap under your child's bottom. STYLE: The Safety 1st Complete Air is one of the most stylish car seats I have seen. The sleek styling is sure to please any parent. Though I did not like the feel of the fabric at first, I think it does help keep the baby cooler both in summer months and in a warmed car in the winter. If you live in the South I imagine this is a great plus. ROOM FOR IMPROVEMENT: While I really liked the car seat overall, there are a few things that could be improved upon and hopefully will be in the next models of this car seat. It would be helpful if it fit into more car models, our Honda Accord is not that small, it really should fit in it. At the given price point of this car seat I thought the shoulder and belly pad would come standard. Not just as a comfort feature, but as a safety precaution as well - it would help prevent belt marks on the baby upon impact. The harness could also be improved upon, it would be great if it was a bit easier to release. Not so easy a child can do it of course, but easy enough so I don't have to huff and puff over it. My biggest concern though is that the car seat is intended for a baby starting at five pounds, at which point the baby will not reach the Air Protect cushions. It would be great if the car seat came with an infant pillow that would make it even safer for a newborn in the event of a crash. My ten month old just about reaches the lowest level of the head restraint, and she is taller than average. VALUE: Technically the Complete Air car seat can get your baby from 5 to 50 pounds. Though for convenience I would still recommend an infant car seat for your baby's first six months (shhh, don't tell anyone about the Air Protect infant car seat coming in the near future). This car seat is a great value considering the side impact protection it provides that is superior to many other car seats on the market. The Safety 1st Complete Air Car Seat retails for $249.99 and is available at Toys R Us and Babies R Us.